If you are a soccer parent, first of all, thank you for signing up your son/daughter for youth soccer! Congratulations, your child is now part of approximately 17 million youth soccer players in the USA today. Unfortunately, only a fraction of these players will continue to play beyond age 13. There are many reasons for this (getting older, other interests, etc. 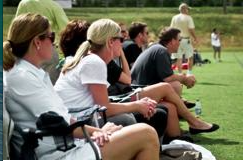 ), but, as a soccer parent, one is completely in your control: do you cheer or coach from the sidelines? I define cheering as celebrating/praising something that your son/daughter or their team has done well (or tried to do). This may be a particularly nice pass to a teammate, a great save by the goalkeeper, a cool dribble move, etc., but it does not always have to be outcome oriented. For example, the player that got beat by the dribble move may have immediately turned back around and hustled to try and recover the ball. The fact that he got beat is irrelevant; the fact that he responded positively (instead of just standing still, throwing arms up in the air, etc) is worth celebrating! I wholeheartedly believe in the philosophy in soccer (and in life) that what gets praised gets repeated. I’m sure people can throw up counter examples, but we’re essentially talking about kids playing soccer here. If the only things that parents and spectators on the sidelines said during games were encouraging and celebrating great effort, then the players would feel good about themselves regardless of the result of the game. Furthermore, it much more likely that players would give their best effort each and every game because they are playing free from their fear of criticism or “coaching” from the parent/spectator sideline. Which brings me to coaching from the parent sideline… Let’s be clear, soccer is a sport unlike football, baseball, basketball and other sports in that the coach cannot micromanage the plays or the players (even though he or she may try!) This is because soccer is a free-flowing, dynamic, and, crucially, a relatively stoppage-free game. Therefore, players must make many real time decisions on the field and deal with the consequences before a stoppage in play (such as halftime, full time, getting substituted) when it may be possible to get instructions. A coach’s real work is done at practice. Hopefully, he or she is recreating game-like situations on a regular basis with the kids getting lots of touches on the ball and having fun. It’s off-putting to the player. By the time they have heard you, processed the information, and then tried to implement it (or not), the situation has likely changed. It is probably wrong information. I say this because you may or may not have soccer playing experience. You may or may not have soccer coaching experience. But it is highly doubtful that you have been at every practice, heard every talk the coach has given to his/her team, and know the coach’s strategy (collectively and individually) for that particular game. Therefore, even if you can argue that the information is “correct,” it is probably “wrong” or incorrect in this context. It puts the player in a difficult situation. During the game, are they supposed to listen to you or their coach? It should be the coach! If you disagree, please feel free to submit a coaching application, as we are always on the look out for more coaches. In the meantime, make the game easier for your child by simply being their greatest cheerleader. It creates a negative environment on the sidelines and causes the players to be more worried about what is going on off the field rather than on the field! Don’t be that parent who “gets into it” with another parent, the ref, or worse, the other team. It undermines the coach. It is the coach who is volunteering his/her time so this group of kids can have a team. They are there before the beginning and stay after the end of each practice. They are going above and beyond. Allow them to do what they signed up for and don’t confuse your son/daughter at the same time! You may disagree with the coach’s lineups, their playing philosophy, you may know more than the coach, but if you undermine him/her, then maybe they won’t coach again next season. Will your child have a team to play on? Maybe someone else’s son/daughter now can’t play because there aren’t a enough coaches. In short, support the coach and let the kids play! I understand this may be a touchy subject, but if parents stick to cheering vs. coaching from the sidelines, youth soccer will be a much more fun, productive environment. Letting you and others know about my Saturday experience. First I had noticed nothing negative from the parents, but a number of my players in the U8 girls seemed unusually concerned and negative about the fact they were out scored 3-0 in the first half and 4-0 for the game. This attitude seemed to support the message of over competitiveness in youth soccer. I stayed positive through out the game and anticipate a learning curve. I feel on a better path with the coaching seminars and web support. On the other hand, I was caught off guard by the mindset of a possible few players that quickly spread to many. Comments included ” they are cheating, it not fair, they are going to be bragging at school” all of which were either untrue or not yet happened. I know how we where beat on many goals (change of possession with opposing goalie pushing ball past our defense) but am resisting excessive coaching of position play or strategy to that resembles set plays. I have instructed / worked on formation and assigned roles during game but play does not yet indicate much is learned which I am ok with. Vast majority of time spent maximizing touches (3v3 or better) and verbal instruction time minimized 5 minutes max guided dialog. Planning to keep with advocated practice and game philosophy unless advise otherwise. Anticipate being outscored more in the first half of the season than the second. Hopeful that player attitudes with become more positive and they will like soccer more at the end of the season than they did starting the season. No doubt that individual player development is going to be great. Thanks for the feedback, Brad. Yes, please do stick with maximizing touches on the ball and allowing the girls to play in practice. Sometimes I see coaches spending way too much time on specific scenarios that rarely occur on game days and it just wastes the practice time. Individual player development is what matter most. At the end of the season, are your girls going to be better soccer players? Did they have fun? Do they want to play soccer again next year? As coaches, our goal has to be three “yes” answers to these questions! Trust me, in no time at all, they won’t remember the score of a particular game, but they will never forget the coach that taught them how to do toe taps, or play sharks and minnows, or the friends that they made.